Wolf 359: Listen Before It's Gone! Home » Stuff We Like » Podcasts » Wolf 359: Listen Before It’s Gone! Wolf 359: Listen Before It’s Gone! Wolf 359 is right in the middle of its fourth and final season. The Webby nominated sci-fi serial takes place aboard the USS Hephaestus. The story is told through the (often unreliable) communications log of officer Doug Eiffel. 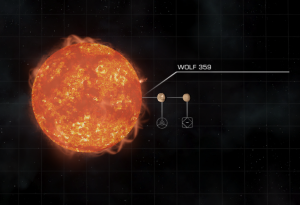 As the space station Hephaestus orbits the red dwarf Wolf 359 (also of Star Trek fame), it broadcasts out into the black of space, hoping to find signs of other intelligent life. One of the most unique shows to come out of the podcast boom, this audio drama is not to be missed. Over the past four seasons, the crew of the Hephaestus has undergone a mutiny, AI trouble, and Doug trying to kick his cigarette habit, among other problems. This podcast is at times, as funny as it is scary, as heartwarming as it is disconcerting. Episodes of the podcast range from twenty to thirty minutes long. Episodes are released bimonthly. 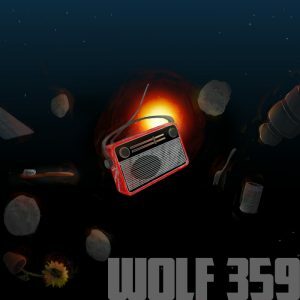 Garnering over 50,000 regular listeners per episode, Wolf 359 is one of the most popular audio dramas in the podcast-verse. The podcast has over 400 supporters on Patreon. Wolf 359 also has many famous fans, including Joseph Fink (Welcome to Nightvale, Alice Isn’t Dead), Lauren Shippen (The Bright Sessions), and David K. Barnes (Wooden Overcoats). Wolf 359 ‘s final season premiered on June 12, 2017. The final episode will hit airwaves in December of 2017. The podcast has received over 3 million downloads since it was first released in 2013. The show is often listed in the top 25 audio drama podcasts on iTunes. Wolf 359 is written and produced by Sarah Shachat and Gabriel Urbina. It is co-written by Zach Valenti. You can listen to episodes of Wolf 359 on iTunes, GooglePlay, and at Wolf359.fm . You can follow @Wolf359Radio on Twitter.